Panelists examined the consequences of a rapid increase in oil prices yesterday evening at the IOP. The roleplayers on the right are former University President Lawrence H. Summers and Corporation fellow Robert E. Rubin ’60. 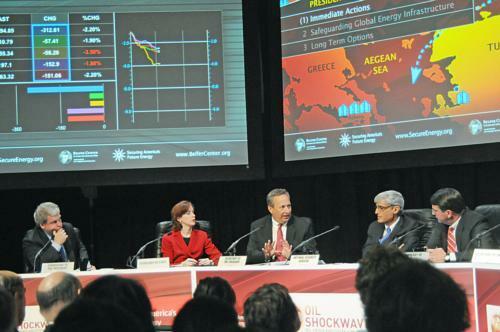 The simulation, called Oil ShockWave, was developed jointly by Securing America’s Future Energy (SAFE) and the Belfer Center for Science and International Affairs at the Harvard Kennedy School. The exercise consisted of a U.S. Cabinet responding to a worldwide oil crisis following terrorist attacks that hampered the global oil supply. The scenario, which was set to take place in December 2009, moved forward through information from three sources: news clips from a cable news network, full Cabinet briefings to which audience members were privy, and secret memos addressed to the various Cabinet members. Rubin, a former U.S. treasury secretary, played the role of national security adviser on the panel and acted as a moderator addressing the different viewpoints expressed by the panelists on how to handle the short- and long-term effects of the crisis. Meghan L. O’Sullivan, a former deputy national security advisor, acted as secretary of state and dealt with some of the demands placed on the U.S. in exchange for an increase in production by oil-producing nations. Some of the other issues that panelists addressed included creating a national speed limit and raising gasoline taxes to decrease domestic oil demand, opening the Strategic Petroleum Reserve to deal with the shortfall in supply, and working with allies to coordinate a strategic response to the global oil crisis. In an interview after the event, Summers expressed his view that a long-term solution to U.S. reliance on oil would depend on prices, and that higher prices would induce greater economic efficiency. Summers added that it would be valuable to develop simulations for government classes, which he said would benefit tremendously from the hands-on learning environment. Audience members seemed to enjoy the event on the whole. Jarret A. Zafran ’09, president of the Harvard College Democrats, said he found the event to be both interesting and important. —Staff writer Prateek Kumnar can be reached at kumar@fas.harvard.edu.